I don't think I've said this for a while, but writing my blog and you reading and enjoying what I write, is a dream come true. THANK YOU. Sometimes when I worry about other things in life, I remind myself about my blog. My little corner of the internet and the world that I created. A space where I can share my experiences, thoughts and feelings with you in the hope that you may take something from it and use it to help you in some way. The feedback I get from you suggests that it does help you and this in turn, inspires and encourages me to keep being curious about life and sharing it with you. Like the Butterfly Effect. 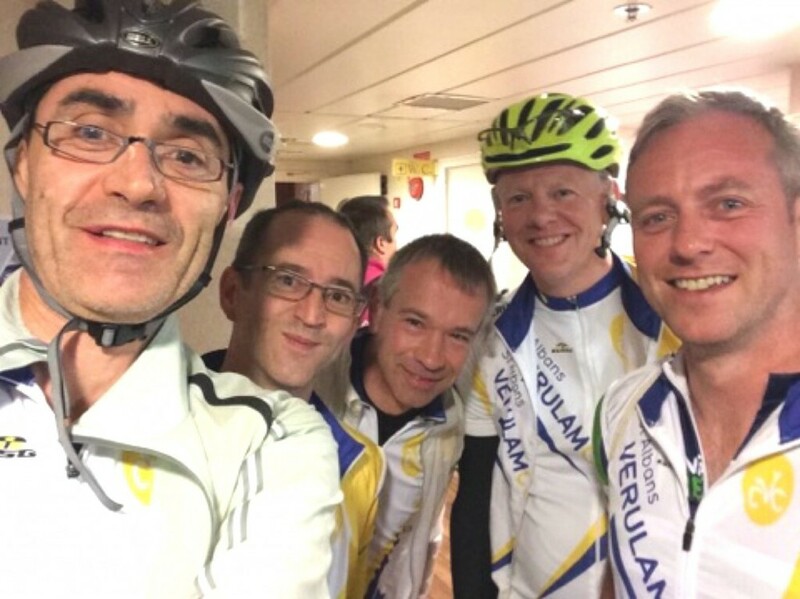 In March I cycled London to Paris in 24 hours with Sean Conway. It was my fourth time, yes, that's how much I love it! I shared tweets and pics along the way and blogged about it here. It seemed to create a bit of a stir and since then my Twitter feed has been full of people undertaking this epic challenge and sharing pictures, blogs and stories with me. Thank you all not only for reading my blogs and using it as inspiration to undertake your own challenges, but also tagging me in on your adventures. It makes my day! Last weekend there were three different groups off on this challenge. It was great to see how it all played out for you and of course, the pics of the beers at the end. Going back to this idea of the Butterfly Effect... I find it amazing how one person can do something, that leads to other people doing something and this just keeps on going and giving. My vision with my blog and Twitter was always to create something like this. Each time someone goes on an adventure, they take someone with them and keep spreading the adventure love. Keep going folks it is awesome! 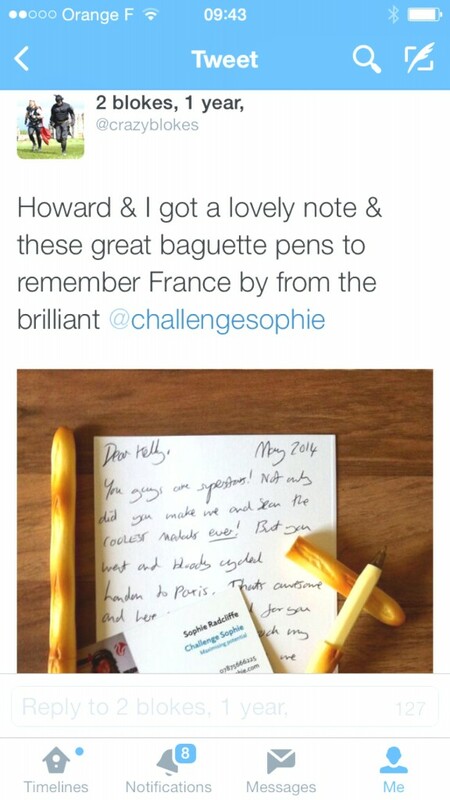 I thought I'd share a few of my favourite London to Paris adventurers with you. If you are interested to do this challenge but are looking for people to go with, email me here as I have lots of requests and can hook people up. I have to say a special thank you to Kelly Stevens AKA Crazy Blokes for not only going off and completing London to Paris after reading my blog but also making Sean and I medals. You guys are legends. In response to receiving this medal, I sent Kelly and Howard my medal that I give to my fellow adventurers when I cycle to Paris with them - a baguette pen. I challenge you to find one of these, they are hard to come by! 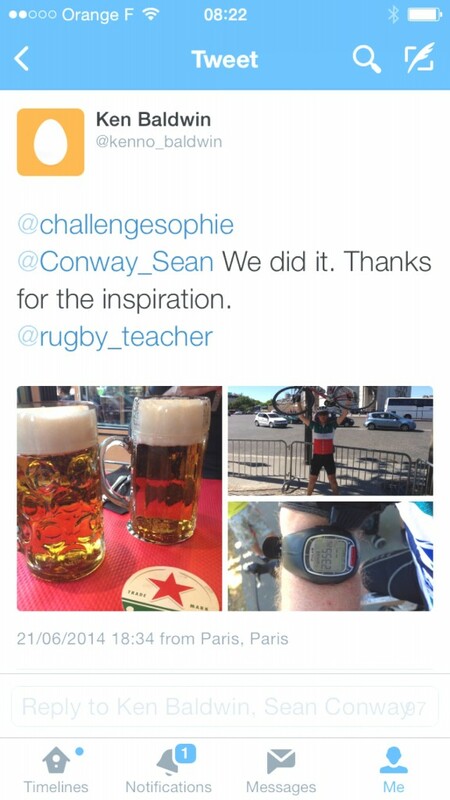 Keep sending all this to me and use #London2Paris or #L2P24 in your tweets so I can check up on who's doing what. Tom has done a whole range of incredible challenges since being diagnosed with Chron's Disease. As if cycling LEJOG wasn't enough, the very next day he cycled London to Paris in sub 24 hours and seemingly loved every minute of it. Go Tom! What beautiful weather and a nice crew of two people means you can get the miles done. Well done! First of many adventures for this pair! A challenge for Hollie on her journey to the Ironman World Championships in Kona. You rock girl! 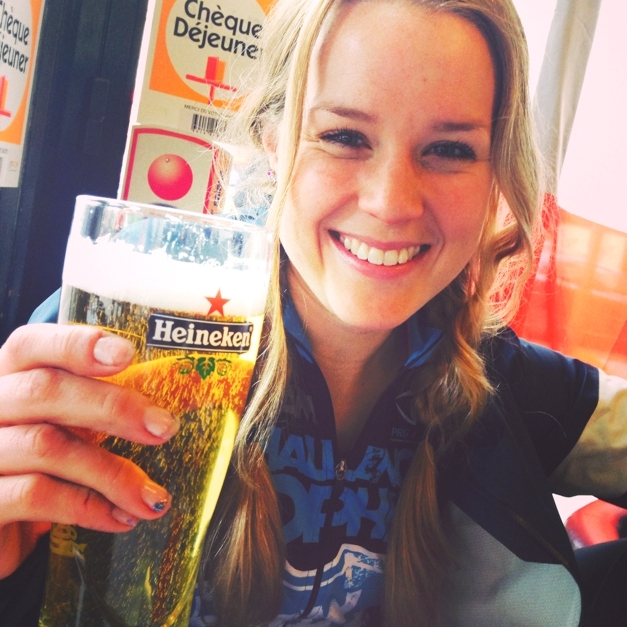 If after reading this, you want to raise your bike above your head in front of the Eiffel Tower and enjoy the sweet taste of well deserved French beer after cycling 200 miles, go for it. You can email me here with any questions and check out my blogs here and here on how to plan your own adventure. Have fun and don't forget to tag me!